This DVD Video is produced with 500 pages visuals, text and Scriptures in five sections as shown below. They are widely used for Bible teaching and evangelism and are NARRATED in English or Spanish. There are broad applications almost anywhere a DVD player and TV can be used such as S.S. and other Church and Home Bible Classes. With a DVD player connected to a Video Projector, they can be seen and heard in churches and other large groups. Loan or give them for evangelism and gifts. They can be used on English speaking mission fields that use the NTSC format TV and video equipment. The NTSC format is used in North and Central America, the Philippines, South Korea and Japan. (Not in foreign countries that use the PAL and SECAM formats.) 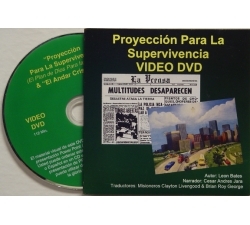 More than 20,000 of these DVD Videos have been produced for ministry use for the glory of our Lord Jesus Christ. They are now available at reduced quantity prices for even greater ministry outreach.